Dubai, UAE, May 30, 2016: A team from Abu Dhabi Grammar School has won a national high school innovation competition with a unique invention aimed at conserving natural rainwater for use in irrigation systems. The competition, organized by Canadian University Dubai (CUD), was staged alongside the International Conference on Leadership, Innovation and Entrepreneurship held recently in Dubai. It challenged teams of senior high school students to develop a new technology, business concept, product or service that reflected one or more of the conference themes. The top ten projects were presented to a multidisciplinary panel of academic judges during day one of the conference. 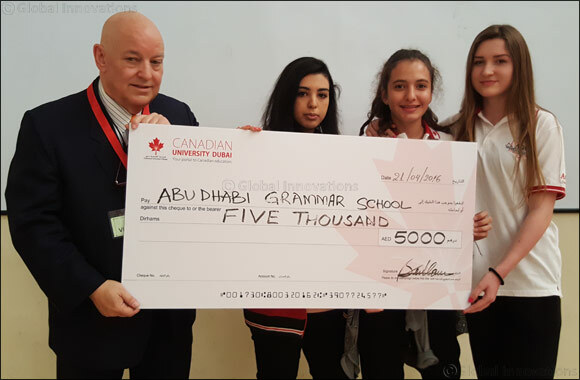 The all-girl group of students – Hamida Al-Aribe, Sama Abdelsalam and Dana Dobrosavljevic – presented the winning entry on behalf of the Abu Dhabi Grammar School team, taking away AED 5,000 for their innovative and environmentally-conscious technology. Taking the second prize of AED 3,000 were Braden Bihag and Carl Vinter, representing their team from Dubai International Academy. The pair secured the runners-up position with their project AeroCig, a product that uses revolutionary filter technology to eradicate secondary and tertiary smoke from the burning end of a cigarette, to protect non-smokers in a smoking environment. Third place in the competition was won by Noor Walid Eldegwy, Sawsan Nasser Elsharqawy, and Shahd Refaat Odeh, of Al Ma'arifa International School. The team took away AED 1,000 for their creative app, CAP (Capture.Airport.People), which aims to ease airport travel through a number of experience enhancement features. All of the top ten shortlisted projects, which had been selected during a qualifying round at CUD, were showcased to more than 200 delegates attending the international conference, held at Atlantis, The Palm.